Preheat oven to 350°F. Line a muffin tin with paper liners. In a medium bowl, whisk together the oil, eggs, yogurt and vanilla. In a separate bowl, sift the sugar, flour, salt, baking powder, and nutmeg. Pour the wet ingredients into the dry and stir to make a thick batter. Gently fold in the diced pears. Scoop the batter into the prepared muffin papers. 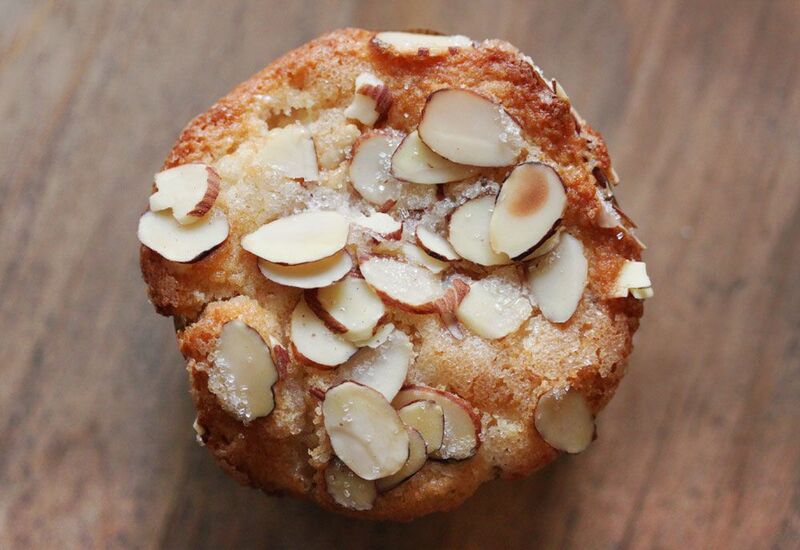 Top each with sliced almonds and a sprinkle of sanding sugar. Bake for 25-30 minutes, until the top of the muffins spring back when gently pressed. Because of the yogurt and the juicy pears, these muffins keep well until the next day, making them ideal to make ahead for brunches, guests or just to tuck into a lunch box for a treat.